Hey everybody! I'm so excited today because I've been asked to hop along with the Stamping Sunday crew as their guest designer. What an honor! The theme for the hop is Stampin' Blends so it'll be fun to see the different and creative way everyone has used them. The Stampin' Blends markers are alcohol based markers and are great for so many uses. The obvious use to color on paper but keep on reading to find a couple of other uses for them. 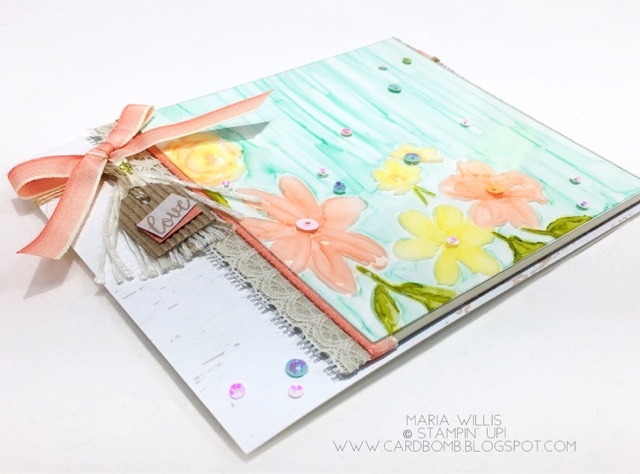 For this hop I decided to try something that I haven't tried before and I used my Stampin' Blends on acrylic to create a fun, artsy, faux-watercolored look. 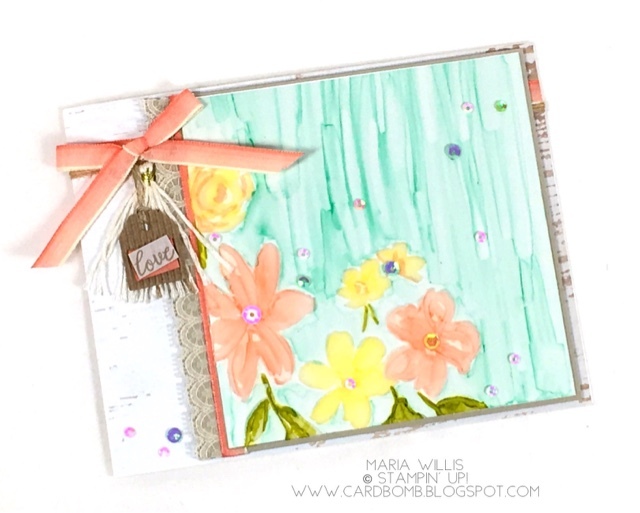 I started my card by selecting an acrylic sheet from the Petal Passion Memories & More Card Pack (available when the new Occasions Catalog Launches on January 3, 2017). 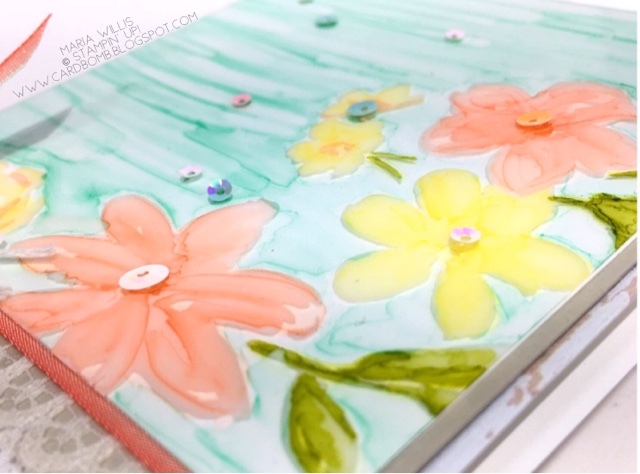 This acrylic sheet was preprinted with some subtle white flowers on it. I used those flowers as a guide for my coloring and colored on the textured side as the texture held the color well. For the flowers I used the Daffodil Delight and Calypso Coral Blends. The leaves were done with Old Olive. At first I wasn't sure that the smooth acrylic was going to hold the ink very well. I had started with Soft Sky and decided to use the light Bermuda Bay Stampin' Blends to do the background. I started to see a light layer of color. As the color started to dry I was able to add to it by coloring a second layer of color over the first layer. This also moved some of the color around resulting in a brush stroke look that I think looks like a soft and pretty watercolor painting. When I was done coloring, I layered the acrylic sheet over a piece of Whisper White Cardstock and added Iridescent Sequins with reckless abandon. This all got layered over Sahara Sand cardstock and some Very Vanilla Lace Trim. After that I embellished with some Calypso Coral Ombre Ribbon, some Linen Thread, a tassel and tag from the Corrugated Elements pack. If you look closely you can tell that I colored that tiny little piece behind the sentiment with my Calypso Coral Blends. Originally, I was going to use Calypso Coral cardstock but the color was too bold. The Stampin' Blends were the perfect shade for this project. I didn't end up using it (because I LOVE this ombre ribbon) but I actually made a custom color ribbon for this project out of white ribbon colored with my Stampin' Blends. It colored evenly and dried quickly and was an easy way to get just the color of ribbon you were hoping for. 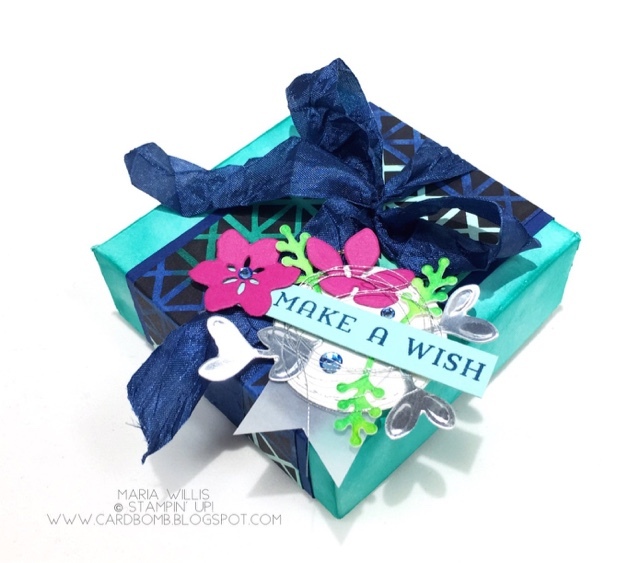 I've also made a box to show the versatility of the Stampin' Blends markers. For this project I used a strip of black and white DSP (Petal Passion DSP) and colored it in with my Blends. I used both of the Pool Party, Bermuda Bay and Night of Navy markers to create an ombre look on the DSP. Here's a closer look at the DSP so that you can see how well the colors blend. It's unbelievable easy too. I like to start with my light marker, then I use the darker one. After both colors are laid down, I use the lighter of the colors to blend the line where the two colors meet. It's really great that you can do this and it does not ruin your markers! 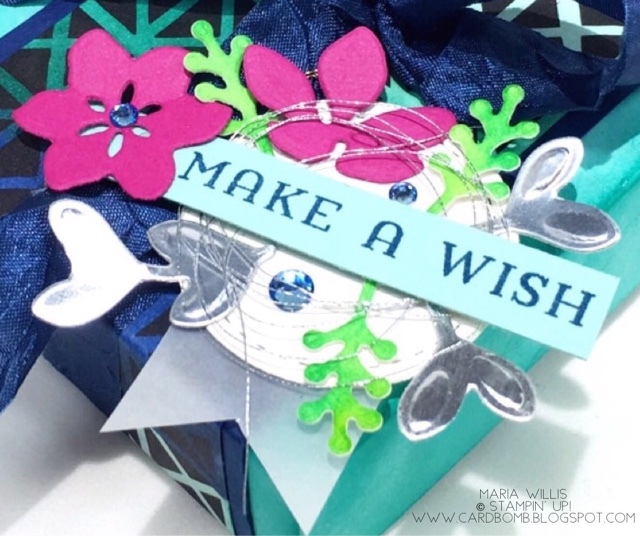 Another fun way to use the Stampin' Blends markers is to color your embellishments. I already mentioned making custom color ribbon and you can do the same thing with your rhinestones too! I used the light Night of Navy marker to color these sparkly bits before adding them to my layered sentiment piece. I love that we can now have many colors of rhinestones that match SU colors perfectly. Here's a last look at my box and that Blends colored DSP peeking through as an accent piece. That's it for today folks! Thanks for stopping by my blog and I hope you'll keep on hopping with us to see what the rest of the crew has made. If you'd like to keep on hopping please follow the list of names in the Blog Roll below until you've seen everybody's beautiful creations. A huge thanks to Sara Levin and the Stamping Sunday team for inviting me to join them this week. It's been fun ladies! 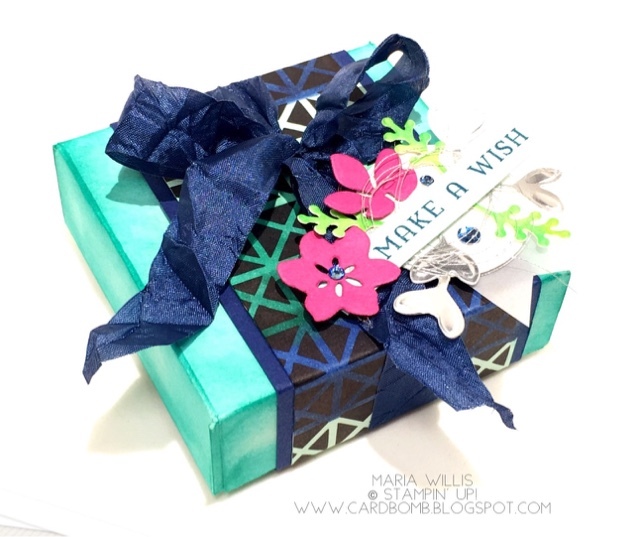 Love your bold use of color on your two lovely projects. Stampin' Blends on acrylic...Cool!! 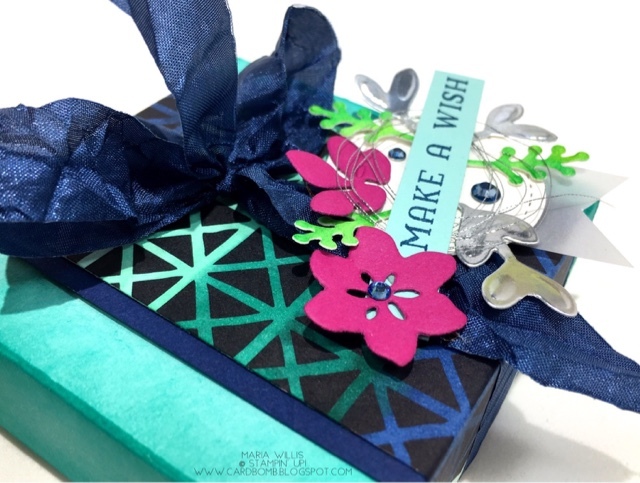 Thank you for being our guest designer on today's Stamping Sunday Blog Hop! Hi Maria, whoop whoop. I love your projects and the bright colors :) Thank you! Very cool - thanks for sharing and for the directions!